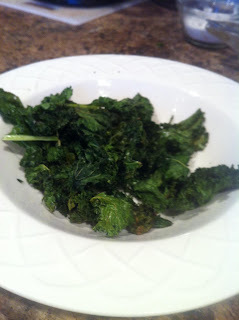 Kale Chips - WTF is that you ask? Kale is a large green leaf that is always next to the mustard and collard greens at the grocery store. Its huge, dark green leaves with thick stems. Take it home. Its great for you, and this is my favorite way to eat it. Take 1 bunch of kale and rip the leaf part off the stem, in bite sized pieces. Place on cookie sheet and drizzle olive oil over it, then sprinkle a large pinch of sea salt. Use tongs to mix it up. A full bunch usually takes two batches. Place in preheated oven at 350 degrees until the leaves are dry and crunchy, but not burnt, about 10-12 minutes. Stir if needed. Sometimes I feel like it doesn't crisp all the way, so I'll take it out, let it dry a bit, and then put it back into the oven for another 5-10 minutes to get it extra crispy. They are delicious warm, but can be eaten anytime.